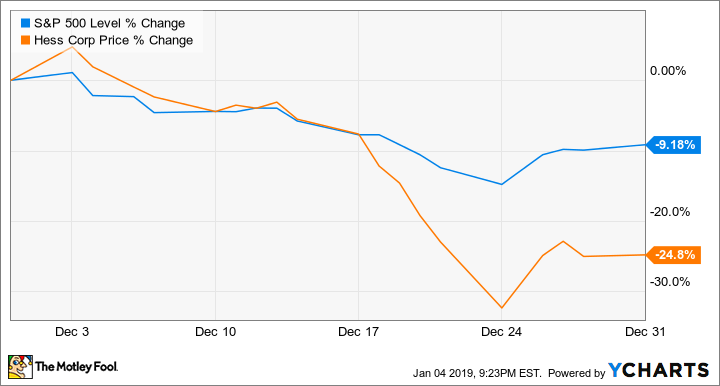 Hess stock saw big sell-offs in December and ended 2018 down 14.7% on the year, but shares have bounced back in 2019. Shares of Hess Corporation (NYSE:HES) (NYSE:HES-A) dipped 24.8% in December, according to data from S&P Global Market Intelligence. Last month was a volatile stretch for stocks, with major U.S. indexes posting their biggest percentage-based declines across a December period since The Great Depression. Hess' valuation was also pressured by industry headwinds and a potential roadblock to one of its key growth avenues. The energy company has partnered with ExxonMobil (NYSE:XOM) to drill for oil in recently discovered reserves in Guyana, but Exxon announced on Dec. 24 that it temporarily ceased operations off of the country's coast following a confrontation with Venezuela's navy. Falling oil prices also weighed on Hess stock in December. ExxonMobil discovered oil off the coast of Guyana in 2015 and has partnered with Hess to extract it. Venezuela, which borders Guyana, ordered Exxon's research ship to turn around because it believed the ship crossed into its territory. Exxon complied with the request, but officials from Guyana have since stated that the ship stayed within Guyanese waters. Exxon's ships have yet to return to the disputed area. Crude oil prices also sank below $50 a barrel and hit a 14-month low in December, and along with a trek into bearish territory for the broader market, helped send Hess' shares tumbling last month. 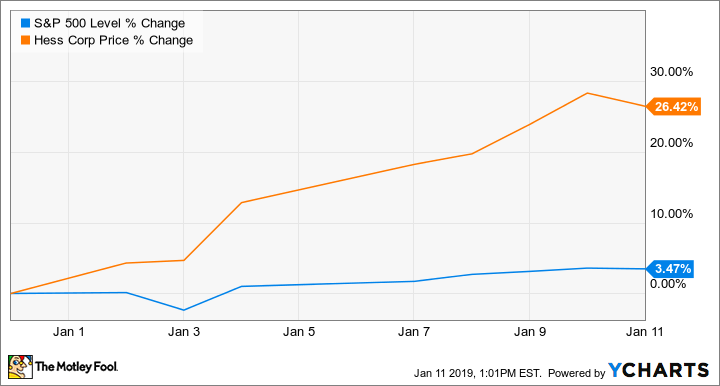 Hess Corporation stock has rebounded in 2019, with shares trading up roughly 26% in January so far. As my colleague Matthew DiLallo has detailed, Hess has promising growth prospects as it ramps up drilling on the Bakken Shale and moves toward beginning offshore Guyana production in 2020. The company expects that it will be able to increase its total production at a 10% annual rate through 2025 thanks to these catalysts. Along with forecast pricing trends and low operating expenses in Guyana, Hess anticipates that it will be able to increase cash flows at roughly 25% annually across that stretch.